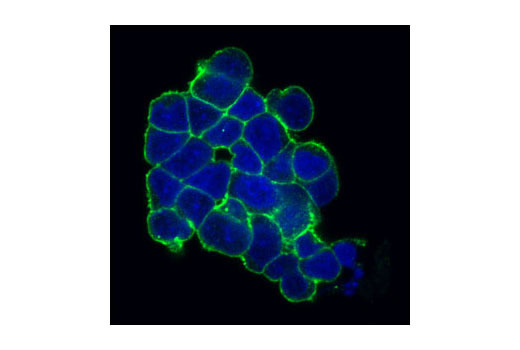 Confocal immunofluorescent analysis of H526 cells using c-Kit (Ab81) Mouse mAb (Alexa Fluor® 488 Conjugate) (green). Blue pseudocolor = DRAQ5® #4084 (fluorescent DNA dye). Flow cytometric analysis of Jurkat (blue) and H526 (green) cells using c-Kit (Ab81) Mouse mAb (Alexa Fluor® 488 Conjugate). 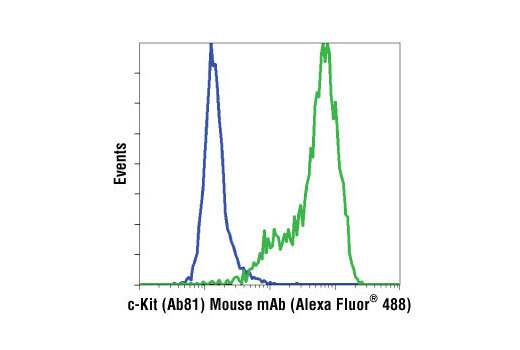 c-Kit (Ab81) Mouse mAb detects endogenous levels of total c-Kit protein. It does not cross-react with other receptor tyrosine kinase family members. Monoclonal antibody is produced by immunizing animals with recombinant proteins containing the cytoplasmic domain of human c-Kit. The antibody was conjugated to Alexa Fluor® 488 under optimal conditions with an F/P ratio of 2-6. This Cell Signaling Technology antibody is conjugated to Alexa Fluor ® 488 fluorescent dye and tested in-house for direct flow cytometry and immunofluorescent analysis in human cells.